“You have people’s words and phrases being misrepresented and looped through the news media and thrown out there on the Internet, and people run with it because these things start getting reported in the mainstream media, and before you know it, people believe that stuff,” Clyburn said. The consequences of such misrepresentation, Clyburn warned, could be severe. “The people of Germany believed Hitler’s foolishness that led to the Holocaust. They believed that stuff,” Clyburn said. “People will tend to believe what they hear through the media. Clyburn singled out “extreme right-wing” bloggers in particular for criticism. He accused such bloggers of forcing Shirley Sherrod to resign from the Department of Agriculture after misrepresenting statements she made to make her appear racially biased. He also said they had libeled the progressive group ACORN, leading to the group’s disbandment. Clyburn is talking about people like me. I wrote about the Sherrod Case, and covered the fact that by 2011 Acorn was been charged or convicted of voter registration fraud in 16 different states in recent years. Wassermann-Schultz is ignoring that fact (here is a partial list). As for the Sherrod Case, Andrew Breitbart does not need me to defend him–he did it well enough himself. Attacks on the right wing blogisphere are common practice, but one part of Rep. Clyburn’s comments is way over the line. The part where he accused right-wingers of using Hitler-like tactics. EXCUSE ME? Hitler? REALLY?? How dare he cheapen the memory of the Holocaust with inappropriate references. I am sick and tired of Democrats and their fake Shoah references (Shoah is the word Jews use for the Holocaust it’s Hebrew for Disaster). Rep. Clyburn..I have many relatives with this on their arm do you have any? 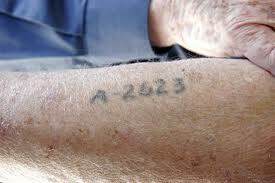 Hitler choose that method of Identifying my relatives because tattooing is prohibited in the Jewish faith. Is that what you meant when you compared me to Hitler? Rep. Clyburn, I never met some of my family because Hitler killed them and buried them in mass graves or cremated their bodies. When you compared me to Hitler, were you saying I do that to people? Are any of your relatives in this photo? 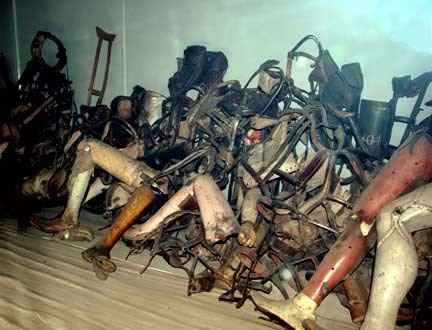 Rep. Clyburn after the Nazi’s gassed their victims they collected their hair, their clothes, glasses, gold teeth and even artificial limbs to be used by the Reich. With the comparison you made on Sirius/XM were you saying I do that after I post a story? Was one of your relatives’ artificial legs recycled after they were stripped naked and gassed? When you compared me ( and other right wing bloggers) to Hitler, did you mean I do horrible things like gassing innocent victims and collecting their gold teeth and artificial limbs? If “extreme right-wing” bloggers didn’t force people to put tattoos on their arms, crowd them in to death camps where they would suffer torture till they were gassed, shot, or died some other horrible death, followed by mutilating their corpses by taking out what can be reused–if we didn’t do any of that, or anything like it…your comparison to Hitler, is not only false and inappropriate, but it cheapens the memory of the who suffered during the Holocaust and those who try to honor their memories. Rep. Clyburn your people have also suffered, they endured the unendurable, the unforgivable horrors of slavery. I would never cheapen the memory of their suffering (or even the later suffering of those who fought for civil rights in this country) by haphazardly calling people racist. I would never call frivolously call people racist, or slave owners, so why do you cheapen the memory of what Hitler did to my people? You want to call me names go ahead it’s still a free country, but leave the Shoah out of it! Rep. Clyburn, you owe the victims of Hitler an apology!